How to make this outdoor summer excursion fun and safe! Cabin fever is a thing of the past! 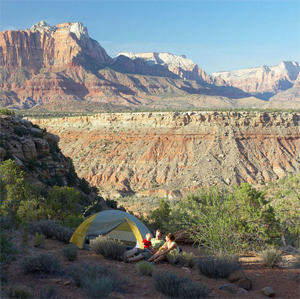 It’s summer— a time to get back into nature, breathe the fresh air and take a family camping trip. An outdoor excursion can be a great time of exploration and adventure, but the National SAFE KIDS Campaign reminds adults and children that taking some simple safety precautions can make your camping trip memorable for the right reasons. Keep first aid supplies and emergency telephone numbers accessible at all times. Know where the nearest telephone or ranger station is located, and carry a cell phone if possible. Dress children in several layers of clothing. The inner layers should be a breathable, synthetic material that pulls moisture from the skin. Remember, a child’s body temperature changes faster than an adult’s. Pack essentials, such as flashlights, extra food, water and rain gear in case of bad weather. Make sure sleeping bags are clean, warm and dry. Inform others where you are camping and when you’ll return. Teach kids how to be safe and responsible in the outdoors. Always supervise children near a campfire or portable stove. Teach them to stay away from campfires and stoves, even when not in use. When making a campfire pit, be sure it is large enough to keep a fire from spreading. Avoid building fires on windy days. Always check the fire danger levels posted at the entrances of wilderness parks and camping areas. Do not build a fire if the park recommends against it. Keep a bucket of water and shovel near the fire at all times. Keep matches and lighters out of children’s reach. Never use matches or lighters inside tents. Never burn charcoal, or use portable camping heaters, lanterns or stoves inside tents, campers or vehicles. Apply sunscreen (SPF 15 or greater) 15 or 30 minutes before going out in the sun so it can penetrate. Apply frequently throughout the day, even in cloudy conditions. Dress your child in light-colored fabrics that cover exposed skin such as the head, arms and legs. Encourage children to drink water frequently to avoid overheating and/or dehydration. Be especially careful in high altitudes, where the sun’s rays are stronger. Apply insect repellent to a child’s clothing and exposed skin. Some repellents are too strong for small children, so consult medical personnel. Always have an adult apply the insect repellent and follow the product’s instructions. Avoid using scented products, such as perfumes and shampoos that attract insects. Be sure to shake out all clothing before wearing it. Teach children not to disturb or provoke any animals they may encounter. Although an animal may look friendly, sudden actions could frighten the animal and provoke an attack. Never leave a child alone with an animal, even if you believe the animal is harmless. Teach children to watch out for snakes and never to touch or disturb them. Check clothing and exposed skin for ticks and other insects after spending time outdoors. Teach children to stay away from all plants and wild berries unless you are certain they are safe. The safest recommendation is to stay away from plants that are not known to you. Teach children to stay clear of poison ivy and poison oak. Carbon monoxide (CO) is a colorless, odorless and deadly gas. CO poisoning kills approximately 30 campers each year. Be aware of potential sources of carbon monoxide poisoning. They include commonly used camping equipment such as portable camping heaters, lanterns and vehicles. Never allow children to hike alone. Teach children to always hike with an adult. Map out your hiking trail ahead of time. Be sure any trail you choose is well marked and do not stray from it. Make sure children are physically capable of the hike’s distance, pace and difficulty. Make sure to bring plenty of drinking water or sports drinks. Hiking can cause dehydration. Bring extra layers of clothing and rain gear in case the weather changes suddenly. Wear proper hiking boots and clothing that covers as much exposed skin as possible to protect from scrapes, bites and poisonous plants. Tell others where you’re hiking and when you’ll return. Keep first aid supplies accessible at all times, even on short hikes.